Spruemeister had the most liked content! As far as using the Woodland Scenics dry transfer lettering as a mask, I can add that this is now problematic. The letter sheet has some sort of adhesive applied to it to apparently to keep the backing sheet in place until you decide to remove it. This adhesive must have some pressure sensitivity properties, whether intended or not, and it more or less makes the application of the letter to a surface permanent. I experimented with WS US 45 degree letters as a mask and I could not get the letters off the surface again. Even attempted to use a hobby knife point to encourage the process, and failed miserably. So be forewarned, it may not work for you. Test first. It used to be a neat and easy way to mask for letters without the clear decal film being an issue on natural metal paint schemes. I do not have any experience with any other manufacturer of dry transfers. Rick L.
You keep at it. You'll figure this model thing out some day. Rick L.
I'll have mine with blueberries. Nicely done. All models (Vought Pancakes or otherwise) are best served with humble pie, but yours is well finished with icing and a cherry on top. The wood grain is wonderful. The Vallejo has done it well. Beats waiting for oils to dry. Now for a side of XF5U?? Rick L.
That's awesome! Well done! Fabulous model subject of a long gone era. The wind in the wires, bugs in your grill, the carbon monoxide up your nose. I would have loved every minute of it. Rick L.
I love that there are still modelers unafraid or unashamed to build clean. For a long time, my build skills only allowed the clean look. But even now I still intentionally do it. I likely will never get completely away from the style. Great looking Corsair! I have one about half done that needs some attention. It too will be nearly factory new in appearance. Rick L.
I'd like to see you take a look at USAAC pre war Blue #23 and Orange Yellow #4. I don't think anybody has picked these up since the demise of the two PollyScale paints. I would think that these two colors would carry a fair amount of demand over a wide variety of subjects. 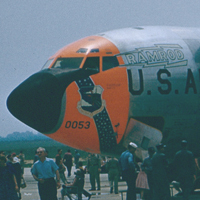 I think it's one of my all time very favorite color schemes for airplanes of a bygone era. Rick L.
I would think British WWII. Their camo colors are quite interesting, i.e.HMS Belfast and Colossus. Rick L.
We'll never know, since it was never built. Reading the proposed flight profile though, it was more akin to a re entering lawn dart than an airplane. Would it have worked? I'm sure it would have gone up, and come down. I'm not so sure it would have been a fun ride. Rick L.
Airfix 1/72 Bristol Blenheim Mk ! It's available at Sprue Brothers. Instructions are to apply over Polished Alclad gray primer or polished bare plastic. Rick L.
I've used exactly 4 separate letters from one of their white letter sheets in 1/72 and had no problems at all. That isn't a comprehensive review of course, and I have read a few disparaging comments elsewhere about their quality and accuracy. But hey, I got four letters to work! Rick L.
It will pick up as time moves on. I'm just now finding enough time to start specific building for the Nationals. Too many choices. Rick L.
It's an idea. I would love to be able to see some past winners as well. But as I think about it, I don't know how easy it will be to accomplish. Mostly because of the logistics of traveling to and from the convention takes some special effort when dealing with transporting your entry models. I've seen some pretty elaborate methods of cocooning and handling models at the Nationals as well as other contests. I wonder if past winners can be enticed to risk the journey all over again for a second time with their previous winners, and current entries. Smaller models and figures; probably easier. Bigger and more elaborate; not sure I would. It just depends upon people's commitment. Worth trying it though. Rick L.
That's not a space, that's a facility! And the one thing you have that I feel is more important than just about anything else in the modeling game: surface area. Well done! Rick L.
Fabulous model, Ron! Nicely done with the add ons. Rick L.